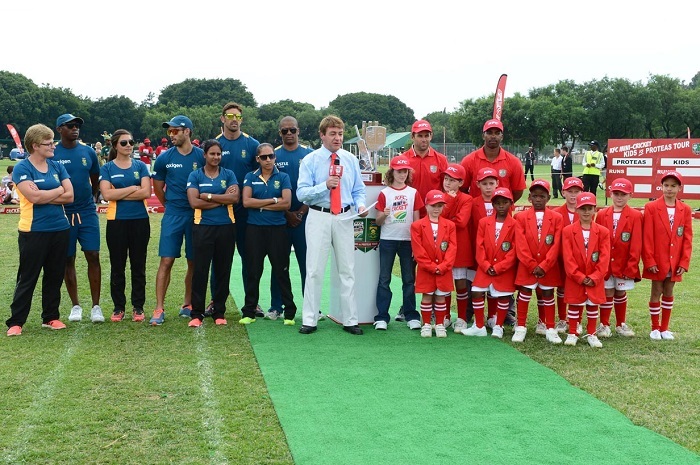 It was an exciting day in Boksburg as the school I finished grade 7 at in 1998, Summerfields Primary School, won the rights to tackle the Proteas in third match of the KFC Mini-Cricket vs. Proteas tour. The stands filled up quicker than shops on Black Friday and there was a cacophony of noise that would make Bloemfontein Celtic Supporters proud. The air of expectation was present as the Proteas tried to grasp their way back into the series after losing the opening two games. My alma mater would be up against it as Vernon Philander would lead the Proteas in his return from injury alongside Farhaan Behardien, Eddie Leie, David Wiese, Shabnim Ismail, Trish Chetty, Lizelle Lee and Sune Luus. With the weather starting to move in their was a nervous anticipation ahead of the hordes of fans including Neil McKenzie and Darren “Wackhead” Simpson. A nervous Philander won the toss and decided to have a bat and sent in Eddie Leie to pinch hit. That plan looked to have backfired as a nasty seaming delivery by Jessica Thomas cut back beautifully to dismiss Leie off the opening delivery (In Mini-Cricket you bat the full two overs as a pair, losing runs for wickets). The Proteas would reassert themselves on proceedings though and set a monstrous total of 71 thanks to a swashbuckling 27 partnership between Vern and Lizelle Lee. With the ever looming threat of rain and the dreaded Duckworth Lewis, Summerfields sent in Jessica Thomas and Coday MacVay to set a solid foundation. The chase of the DL par score mean that wickets fell fairly regularly and pressure was on. Bohlale Mothobia and Matthew Nicholas produced a fine partnership to close the gap and Declan Krtizinger started smashing the ball in a very Lance Klusener type way before the rain, and more scary, the lightning forced the players off the field. As the players took out medical insurance against carpal tunnel in their hands from the hordes of signatures they had to sign, KFC once again proved to make a dream a reality to the children (And parents) of Summerfields Primary School. They appropriately add hope while getting kids active and we salute KFC for that! With two matches remaining in the series, the KFC Mini-Cricket kids lead the Proteas 2-1 and there is everything left to play for in the nail-biting remainder. 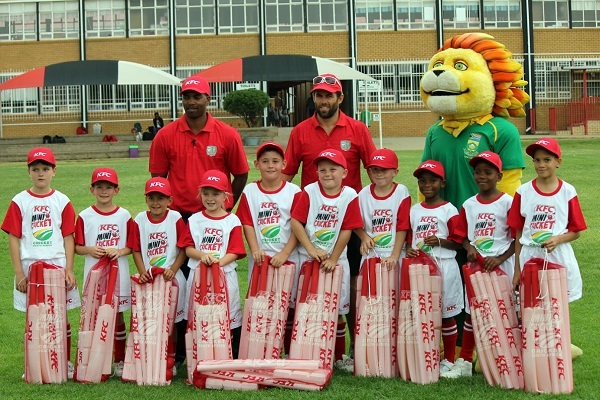 Who will win the third KFC Mini-Cricket Kids vs. Proteas tour?